A willingness to engage directly with international regulatory bodies is key to the success of The Bahamas' financial sector, according to Minister of Financial Services Ryan Pinder. 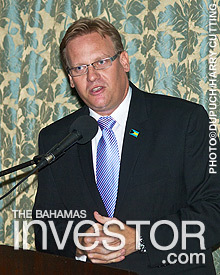 The Minister made the comments during his address to the Nassau Conference at the British Colonial Hilton yesterday. A willingness to engage directly with international regulatory bodies is key to the success of The Bahamas’ financial sector, according to Minister of Financial Services Ryan Pinder, who said that the country has already seen the benefits of meeting with legislators and promoting its interests. Navigating increased regulation and greater transparency can be difficult for smaller jurisdictions, but issues can be resolved through more productive and focused engagement said Pinder addressing the Nassau Conference at the British Colonial Hilton yesterday. The Minister said engagement of this nature has proved successful in the past, with The Bahamas successfully negotiating an important exemption from the upcoming Foreign Account Tax Compliance Act that would prevent the creation of a trust registry. He also spoke of the importance of the country’s membership of bodies such as the G20 and its representation at international events where the global financial agenda is set. To ensure future growth, Pinder said The Bahamas is taking a “collaborative and progressive approach” and is committed to automatic information exchange. 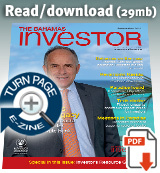 But, while transparency has become the benchmark of the international financial community, Pinder warned that this approach was not always beneficial, saying that information exchange could expose some clients to a significant safety risk–especially those based in Latin America, where The Bahamas has been building its presence. He suggested that bi-lateral agreements, negotiated country to country, could be a viable alternative. Additional speakers at the Nassau Conference, which is sponsored by the Ministry of Financial Services and the Association of International Banks and Trust Companies in The Bahamas, included: Minister of State for Investments Khaalis Rolle; deputy chief executive of Society of Trust and Estate Practitioners George Hodgson; Bahamas Association of Compliance Officers president Shasta Treco-Moxey; and Tanya McCartney, past president of the Bahamas Institute of Financial Services. Minister of State for Investments Khaalis Rolle opened one of The Bahamas' financial community's most important summits yesterday with a call for professionals in the industry to take advantage of opportunities, engage globally and stay current.